The remaining three couples were revealed in an E! News exclusive. First up, are Ashley Martson and Jay Smith, from the last season of 90 Day Fiance. These fun newlyweds sure know how to stir the pot! From GoFundMe pleas to rescinded divorce papers to online feuds with other cast members, the Martson-Smiths have mastered the art of shameless publicity seeking in the off season. They almost make Larissa and Colt seem like social media amateurs. 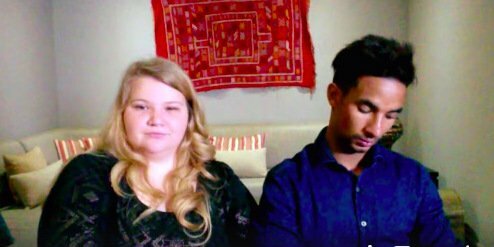 Additionally, 90 Day Fiance regulars Nicole Nafziger and Azan Tefou will be back to inspire us all to find true love. OK, maybe they have inspired us to remain single, but they sure are fun to watch. Despite being arguably the most mismatched couple in all of 90 Day history. Which, I guess, is for our viewing pleasure. Thanks, TLC! Maybe this season we will get some of our burning questions about Nicole and Azan answered: Will they ever marry? Will Nicole ever realize she is an adult and begin behaving like one? Will Azan ever look at Nicole without appearing that he would rather be anywhere else? The Magic 8 Ball says: Unlikely, unlikely and when hell freezes over! Rounding out the cast are Elizabeth Potthast and Andrei Castravet from Season 5 of 90 Day Fiance. The couple just had a daughter Eleanor Louise in January. These two would be my guess to be the most drama-free of all the couples, but time will tell. Sometimes it is the seemingly normal ones that fool you the most. Overall, I think it looks like a great season. The only way the cast could be better would be if Darcey Silva and Jesse Meester make a toxic cameo appearance. Or if a surprise special guest starring role by one of Angela Deem’s Dollar Store weaves occurs! TELL US-ARE YOU LOOKING FORWARD TO THE UPCOMING SEASON OF 90 DAY FIANCE: HAPPILY EVER AFTER? WHAT COUPLE ARE YOU MOST EXCITED TO SEE BACK?